Our real Business expertise is working with the owners/directors/partners of small -sized owner-managed businesses. We also have specific expertise working with contractors, personal service company, construction, restaurants and bars and freelancers. 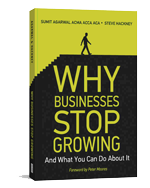 This expertise in the owner-managed business sector has led to us co-authoring our highly acclaimed book titled ‘Why Owner-Managed Businesses STOP Growing & What You Can Do About It’ (incidentally the book retails at £29.97, but you can get it for free if you meet with us). Our inspiration, expertise, skills and knowledge are primed for business owners and entrepreneurs who don’t just want an accountant for compliance services. If that’s all you’re looking for, there are dozens of accountants in Harrow who can do that for you.